Welcome. This site provides first-hand information about wolves and wolf-prey systems, direct from the wilds of Alaska. It is my good fortune to be able to spend my "work" days as a scientist observing wild creatures of many kinds. All of them interest me, each in its own way and for its own important ecological role. But years ago it became obvious from thousands of hours of direct observation that wolves stand above the rest (and domestic dogs) in their unusual intelligence, emotional depth, expressiveness, sensory abilities, physical prowess, and especially their family-based social systems. Thousands of hours of additional scientific observations later, I am still in awe at what I see out there: Wolves enliven the northern mountains, forests, and tundra like no other creature, helping to enrich our own stay on the planet simply by their presence as other highly advanced societies in our midst. Equally fascinating are the underlying patterns of complexity in the way they interact with other wildlife at broader scales, and the functional similarity between these systems and many other kinds of systems throughout the biological and physical worlds. It would be nice to leave it there, to maintain a Web site purely for posting the results of this behavioral and systems research on an upbeat note, with the hope of instilling or rekindling in others some of the rewarding sense of wonder it stirs in me. Unfortunately there are major problems for wolves in Alaska and elsewhere from heavy government-sanctioned killing, including with the use of airplanes and snowmobiles. There have even been Mengele-like experiments to convert their vibrant family groups (so-called packs) to sterile pairs across large regions. The vital underlying patterns of variation that define natural wolf-prey systems are being ignored and replaced. This is being done with parochial, anti-adaptive farming approaches to management that seldom if ever produce and sustain the high, stable numbers and yields of moose and caribou touted by proponents. Perhaps worst of all, these problems originate primarily from biologists and remain largely hidden from public notice due to outright deception. As an independent scientist blessed with the wherewithal to cover this wilderness beat regularly, I feel obligated to report on these unpleasant details at least as much as on my pure research, in the interest of greater public awareness and better decision-making. So you will also find much here - alongside the research results on the Blog and Reports pages - that describes the current and potential problems I am seeing. There will be heavy emphasis on alternative scientific thinking as to how wolves and wolf-prey systems might be managed for greater good. Much of this will come from the wolf-prey research I have been doing in the Denali and Fortymile regions of Alaska since 1966 and 1993, respectively. And much will come from other important systems and behavioral research. Visit regularly. I will be updating and revising at frequent intervals. Alaska Wolves, including images, copyright ©2007-09 Gordon Haber and Wildlife Science Inc. Basic and applied research by Gordon Haber, Ph.D.
Haber’s field notes, his extensive journals, and stories from friends all come together in Among Wolves to reveal much about both the wolves he studied and the researcher himself. The lifetime study of Alaska wolves by Dr. Gordon Haber. Dr. Haber died in a plane crash on October 14, 2009 while attempting to further his and our understanding of wolves. 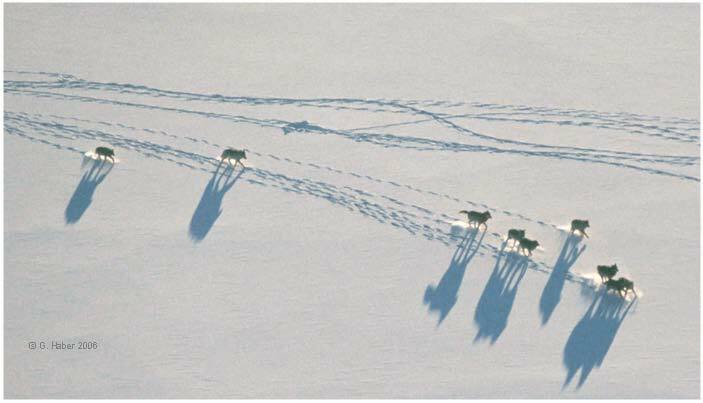 In the above photo, taken in December 2002, nine wolves are playing on a frozen lake in the Denali region of Alaska. Four other wolves of this family group are resting just outside the picture, at the scant remains of a moose the wolves killed a day or two earlier. During winter, the wolf families of this region eat a significant meal of moose, mountain sheep, or caribou on average once every 2.0-2.6 days.1 They obtain these meals while hunting over distances averaging 10.1-17.8 miles per day, including periods of rest. About half their meals come from kills, and 2.0-8.9% of their winter encounters with moose result in kills. The other 47-48% of their winter meals are scavenged (animals that died from other causes); 60-77% of the moose they eat are scavenged. They dig many of the scavenged meals from beneath the snow - from as deep as 8-10 feet into densely packed drifts and avalanches - and must expend additional effort gnawing into the frozen remains. So a good meal is usually a hard-earned, happy event. And over the next day or two, before they begin hunting again, almost anything is likely to trigger another bout of spirited play, such as this opportunity for a wide-open run in fresh powder snow. 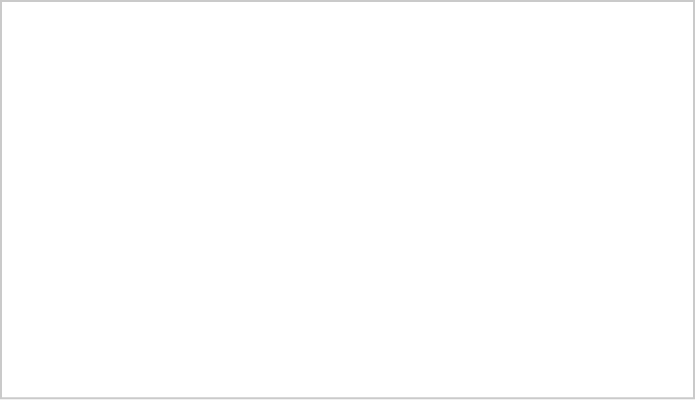 1 The data in this caption are from Tables 37 and 41-44 of Haber (1977). Read Chapter 9 and referenced appendices for related background.